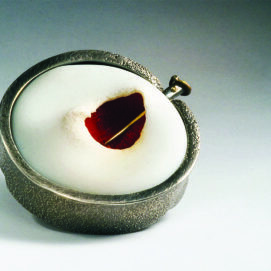 Metalsmith, educator and writer Andy Cooperman works from his Seattle studio where he builds jewelry and objects for exhibitions and private clients. 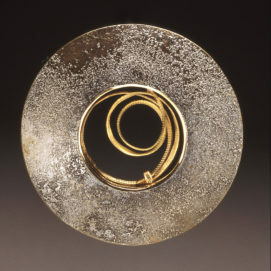 His work and writing has appeared in blogs, magazines and books, including Humor in Craft, Art Jewelry Today (I, II & III) and The Penland Book of Jewelry and is held in private and public collections such as the Victoria and Albert Museum, Central College in Pella Iowa, and the Tacoma Art Museum. As a teacher, Andy’s goal is to help students develop the creative problem-solving tools that will allow them to see beyond standard solutions and open new doors onto the creative process. 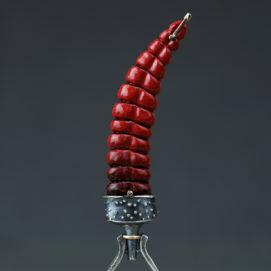 He teaches and lectures nationally and is available as a visting artist, curator and creative pot stirrer. In the Edmund Scientific Supply catalogue (circa 1964) there was a page that featured paramecium cultures. The text described an entire world, utterly alien and invisible to the naked eye, whirling away in a single cloudy drop of pond water. The notion that a complete universe could exist--concentrated on the tip of my finger-- changed everything. I have considered myself a metalsmith since 1980. It was in the late ‘70’s, as an English major in college in Upstate NY, that I first encountered the field, outside of the jewelry and hollowware that I had seen in stores. There was a classroom in the art building (I spent a lot of time in that building) that seemed to contain some sort of focused excitement for the hunched over figures working inside. There was fire and small, strangely specific tools. The sound of hammering made me pull open the door and walk inside. What a shocker it was to see that metal could be sawn, formed and, especially, forged-- in a relatively non-industrial place. And when I saw that it could be approached in ways that made it seem unlike metal, that small, almost animate things could be made with it--I had to get my hands into it. With a second major in Studio Art, I built a small back bedroom studio, spent some time exploring the very similar field of dental crown and bridge manufacture and worked at the bench in several jewelry stores. In 1984, I followed my wife Kim to Seattle, Washington. We have been here ever since. Seattle is a special place for jewelers and metalsmiths. We have a very strong community of makers who are eager to share what they know and what they think. And we all seem to like each other. Almost makes the winter gloom bearable.